HARPER, WILLIAM (BILLY) Passed away April 13th 2019, peacefully at the Royal Victoria Hospital. Late of Bangor. Beloved husband of the late Deborah, loving and caring Father of Stephen, Raymond, Margaret and Jeremy. Devoted Granda to Simon, Adam, Mark, Megan, Charlotte and Emilie. Funeral Service Wednesday 17th April at 9:30am in John Gray & Co, 80 Central Avenue, Bangor BT20 3AU. Followed by a Private Cremation. 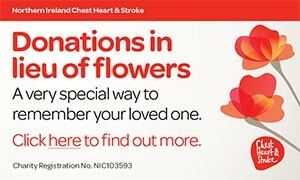 Family flowers only please, donations in lieu payable direct to NI Kidney Research Fund, 69 Ballylough Road, Craigavon BT66 7BQ. I am sorry to tell you that William (Billy) HARPER has passed away.